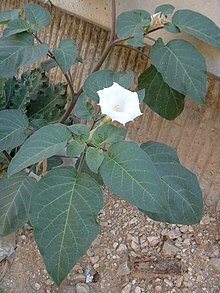 Datura innoxia, often spelled inoxia, (sometimes called by the common names pricklyburr, recurved thorn-apple, downy thorn-apple, Indian-apple, lovache, moonflower, nacazcul, toloatzin, tolguache or toloache) is a species in the family Solanaceae. It is more rarely called sacred datura, but this name in fact refers to the related Datura wrightii. It is native to S.W. United States, Central and South America, and introduced in Africa, Asia, Australia and Europe. The scientific name is often cited as D. innoxia. When English botanist Philip Miller first described the species in 1768, he misspelled the Latin word innoxia (inoffensive) when naming it D. inoxia. The name Datura meteloides was for some time erroneously applied to some members of the species, but that name has now been abandoned. Datura innoxia is an annual shrubby plant that typically reaches a height of 0.6 to 1.5 metres. Its stems and leaves are covered with short and soft grayish hairs, giving the whole plant a grayish appearance. It has elliptic smooth-edged leaves with pinnate venation. All parts of the plant emit a foul odor similar to rancid peanut butter when crushed or bruised, although most people find the fragrance of the flowers to be quite pleasant when they bloom at night. The flowers are white, trumpet-shaped, 12–19 cm (4.5–7.5 in) long. They first grow upright, and later incline downward. It flowers from early summer until late fall. The fruit is an egg-shaped spiny capsule, about 5 cm in diameter. It splits open when ripe, dispersing the seeds. Another means of dispersal is by the fruit spines getting caught in the fur of animals, who then carry the fruit far from the mother plant. The seeds have hibernation capabilities, and can last for years in the soil. The seeds, as well as the entirety of this plant, act as deliriants, but have a high probability of overdose. The currently-accepted botanical name for this plant is Datura innoxia, in spite of the fact that many references spell it Datura inoxia. According to Tropicos, a widely-accepted authority on botanical names, the inoxia form is due to an error originally made by 18th century taxonomist Philip Miller, and since corrected. Modern authorities state that the inoxia form literally means “not noxious”, which certainly does not seem to apply to the highly poisonous Datura. On the other hand, Miller said that the “not noxious” form refers to the soft spines on the fruit, which are in contrast to the sharp spines on other Datura species. (Miller refers to the … “oval fruit, covered with long, soft, innocent spines” …). All parts of Datura plants contain dangerous levels of poison and may be fatal if ingested by humans and other animals, including livestock and pets. 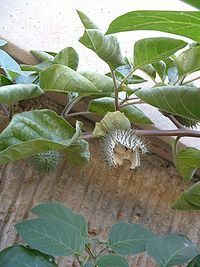 In some places it is prohibited to buy, sell or cultivate Datura plants. When cultivated, the plant is usually grown from seed, but its perennial rhizomes can be kept from freezing and planted in the spring of the following year. Datura innoxia, like other Datura species, contains the highly toxic alkaloids atropine, hyoscine (scopolamine), and hyoscyamine. The Aztecs called the plant toloatzin, and used it long before the Spanish conquest of Mexico for many therapeutic purposes, such as poultices for wounds where it acts as an anodyne. Although the Aztecs warned against madness and “various and vain imaginings”, many Native Americans have used the plant as an entheogen for hallucinations and rites of passage. The alkaloids of these plants are very similar to those of mandrake, deadly nightshade, and henbane, which are also highly poisonous plants used cautiously for effective pain relief in antiquity. Datura intoxication typically produces a complete inability to differentiate reality from fantasy (delirium, as contrasted to hallucination); hyperthermia; tachycardia; bizarre, and possibly violent behavior; and severe mydriasis with resultant painful photophobia that can last several days. Pronounced amnesia is another commonly reported effect. There can easily be a 5:1 variation in toxins from plant to plant, and a given plant’s toxicity depends on its age, where it is growing, and local weather conditions. These wide variations make Datura exceptionally hazardous to use as a drug. In traditional cultures, users needed to have a great deal of experience and detailed plant knowledge so that no harm resulted from using it. Such knowledge is not widely available in modern cultures, so many unfortunate incidents result from ingesting Datura. In the 1990s and 2000s, the United States media contained stories of adolescents and young adults dying or becoming seriously ill from intentionally ingesting Datura. It has also been planted throughout the world as an ornamental plant for its attractive large leaves, large white flowers, and distinctive thorny fruit. However, the plant is now considered an invasive species in several locations. For example, because of the similarity of its life cycle to that of cotton, it is a pest in cotton fields. It is also a potential seed contaminant. Datura innoxia is quite similar to D. metel, to the point of being confused with it in early scientific literature. D. metel is a closely related Old World plant for which similar effects were described by Avicenna in eleventh century Persia. The closely related D. stramonium differs in having smaller flowers and tooth-edged leaves, and D. wrightii in having wider, 5-toothed (instead of 10-toothed) flowers. D. innoxia differs from D. stramonium, D. metel & D. fastuosa in having about 7 to 10 secondary veins on either side of the midrib of the leaf which anastomose by arches at about 1 to 3 mm. from the margin. No anastomosis of the secondary veins are seen in the other 4 major species of Datura. ^ “Datura inoxia“. Natural Resources Conservation Service PLANTS Database. USDA. Retrieved 17 January 2016. ^ “BSBI List 2007”. Botanical Society of Britain and Ireland. Archived from the original (xls) on 2015-01-25. Retrieved 2014-10-17. ^ a b c d Preissel, Ulrike; Preissel, Hans-Georg (2002). Brugmansia and Datura: Angel’s Trumpets and Thorn Apples. Buffalo, New York: Firefly Books. pp. 117–119. ISBN 978-1-55209-598-0. ^ “Datura inoxia_Plant World Seeds”. ^ Annapoorani, S. Grace (April 2013). “An Eco-Friendly Antimicrobial Finish Using Datura Innoxia and Leucas Aspera on Cotton Fabric”. International Journal of Scientific Research(IJSR). 2 (4). ^ “Tropicos / Name – !Datura innoxia Mill”. Tropicos website. Missouri Botanical Garden. Retrieved 2017-03-20. ^ “Catalogue of Life: Datura innoxia P. miller”. Catalogue of Life website. Catalogue of Life. 2017-02-27. Retrieved 2017-03-20. ^ Richard Evans Schultes (1970-01-01). “The plant kingdom and hallucinogens (part III)”. pp. 25–53. Retrieved 2007-05-23. ^ “Erowid Datura Vault : Effects”. Erowid. Retrieved 1 June 2010. ^ “Suspected Moonflower Intoxication (Ohio, 2002)”. CDC. Retrieved September 30, 2006.